Paid To Think Business Magazine | Tapping into current and future business trends! Thanks for visiting our page. Our digital magazine gives you the opportunity to learn about business and to also do more business through joint ventures and promotion. Hop on board and take this platform for a spin. Here is an example of how we can customize a magazine for you. Recently we interviewed Alex Mandossian and we have reviewed his new program, Push Button Influence. Hear the full interview here! Below you will find a quick way to contact us. Problems with Your iPad or App? Make sure to check out how to quickly solve any issue right here! Want to Create Your Brand? You can start building your brand by using our magazine to educate interested readers about your products and services. We will help to create your business cover story for free, (that’s a $200 bonus) if you are a registered advertiser. Learn more here! The first month of advertising is FREE! This following deal is offered to founding members: you will only pay $100 per month, to get 24/7 exposure for your business. We really want to help your NEW or EXISTING business build success. We offer you ideas to help you build your business through the magazine. Yes, we do care what you think and we are also interested in publishing your questions. Send all questions to info@auto-pilot-biz.com. We will compile and publish your questions and try to answer them in future editions. Want to Contribute to the Magazine? If you would like to contribute articles we encourage you to send us your articles and if we decide to publish them you will be notified. Remember, do not send anything to us that you do not authorize for publishing and understand that we will retain copyright of all materials we publish. Send your questions and requests to “PAID ADS” email: info@tutorhelp.com.au. To learn how to prepare your submissions go HERE! – reach readers with iPhones and iPads …. 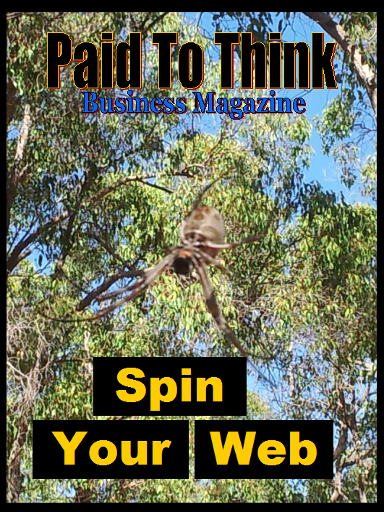 Paid To Think Business Magazine is your platform for promoting your products and services. Let us show you how you can build your list and promote your brand. Imagine your own magazine promoting your business! This is our most important issue so far! What does a ticking time bomb sound like? Any number of events could cause a tsunami of epic proportions and the repercussions will affect us all for years. Would you like to become more accessible to readers via their mobile devices? If so, we want to talk to you about how to prepare your special magazine issue. Download our latest issue here! We would especially love to work with you if you are a weight loss coach, speaker or author. Who Else Wants a Mentor? 10 000 baby boomers will turn 65 each day for the next 16 years – how will that change your world? Merry Christmas – Time to Collect Your Gifts!!! Go here and download our Christmas Edition. Go here and download our latest Newsflash Edition. Who Else Wants to Know How to Make Monthly Recurring Income? and “how to make residual income”. You are invited to attend a 3 Day LIVE Event where you will learn everything about how to do the work once and get paid again and again. Who Wants to Be the Last Woman at the Party? It’s time to download our latest issue and uncover some critical economic truths! Lies, Damn Lies and The Economy Learn why now is the time to Mind Your Own Business and two steps you can take to protect your lifestyle. Does your business model have 24/7 income making opportunities? If not, you are in for a treat! How to create residual income. Still Searching for the Holy Grail of Business Models? I might need to hit you with a two by four before you notice, but those really bad-mannered people in restaurants, on trains and driving in their cars have eyes glued to these things that for some reason are holding their attention round the clock. Is it possible that what they’re looking at is more important than those humans, still to be controlled by digital noise? It’s time to download our latest issue and get the insider’s view on creating a digital magazine! Learn why now is the time to strike out with your own app and blaze a trail of passive and recurring income. In this issue we focus on the use of leverage. The LIVE training for June shows you how to put your online business on autopilot by using webinars. It is time to register if you want the bonus videos. If you are interested in selling physical products then we have you covered. Ezra shows you his method. Go now and download the latest issue! New Edition of Paid To Think Business Magazine is now LIVE! Today more than ever you have access to as much leverage as you want! In this issue we show you how to start improving your R.O.I. by improving your marketing and we feature Armand Morin who shows us just how easy it is to start your online business. Download now! We are getting together the very information which will help you negotiate this new business environment and we understand that you are most probably a one woman show or a one man band. GREAT! Because we see a lot of potential and reduced costs in being small and flexible. Are you running low on subscribers or are you looking for an audience? You know with a world population of 7 billion, you only need a thousand or two loyal members in your program, to make a regular income. In this issue we show you in 5 steps how to start an online business and that’s just the warm up to our, 3 Day Live Streaming event, with Armand Morin, on building your business asset. This training is critical in explaining and formulating your plan. Why would you miss it….or why would you miss downloading our latest issue……. Want to increase your R.O.I.? Download this issue now! This entry was posted in Business and Investing, Digital Magazine and tagged Apple Newsstand, Digital magazine on Newsstand, Money Ideas, Paid To Think Business Magazine on September 22, 2012 by paidtothinkbusinessmagazine. Have You Collected Your Subscriber Bonus? In order to make sure your presentation or tutorial is included for free in Paid To Think Business Magazine, make sure to download issue 53 and follow the steps. You will be contacted with further instructions.